Down To Earth started in 1977 in Eugene, Oregon, as a small store selling products for the home, such as cookware and baskets. Today we continue to operate a retail store in Eugene as well as being a nation-wide distributor of all-natural products and a manufacturing of natural and organic fertilizers. Down To Earth specializes in durable products for the home and garden made from sustainable or recycled materials, like recycled glassware, stainless steel, wood, bamboo, ceramics, wool and beeswax. We believe strongly in natural and organic products, like plants, seeds, potting soil, fertilizer, pest control, body care and cleaning supplies. Our retail homepage, Down To Earth Home, Garden & Gift is the gateway to our Eugene experience. With links to our in-store calendar and the news and events blog, you will always stay current on our upcoming sales, classes and events. The site features a portal to purchase our digital gift cards, so you always have a last-minute gift option. Sign up for our retail newsletter for more information on product, sales and events. 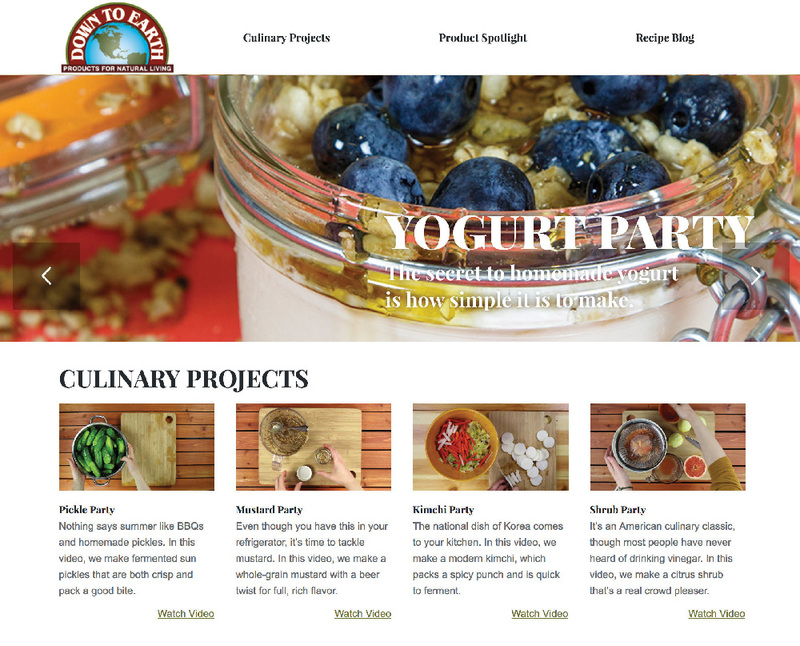 Looking for exciting new recipes? Curious about culinary techniques? Just interested in watching food get made? Whichever the reason, Down To Earth Natural Living has you covered. From exciting basics to the hip, new craze, our videos will get you caught up in the kitchen. 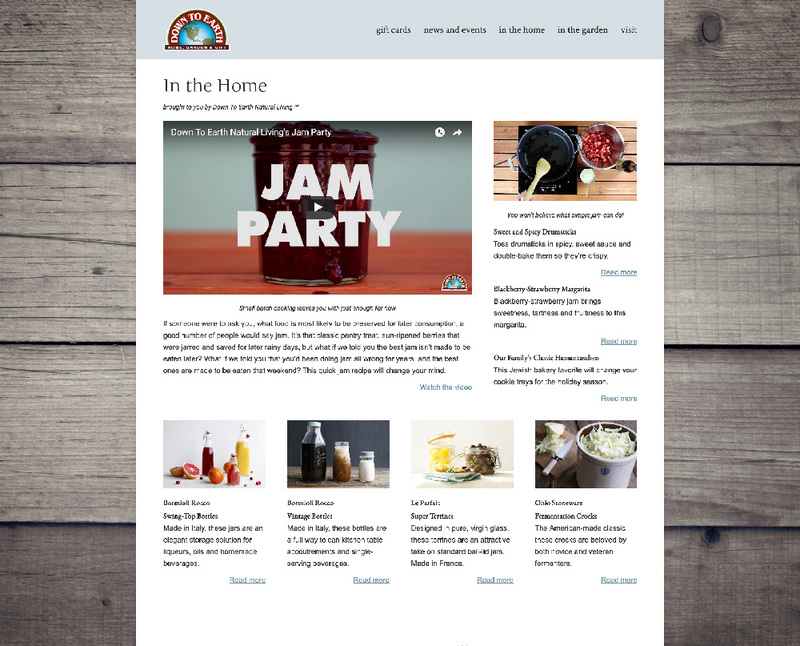 Designed for the food enthusiast, the site will help you learn the difference between different preservation methods like pickling, fermenting and long-term canning. Sign up for our natural living newsletter for more information on culinary projects. Designed for both the freshman gardener and the avid green thumb, Down To Earth Fertilizer has information for every level. With handy videos and downloadable guides, we explain the A to Zs of organic gardening, from soil to fruit. 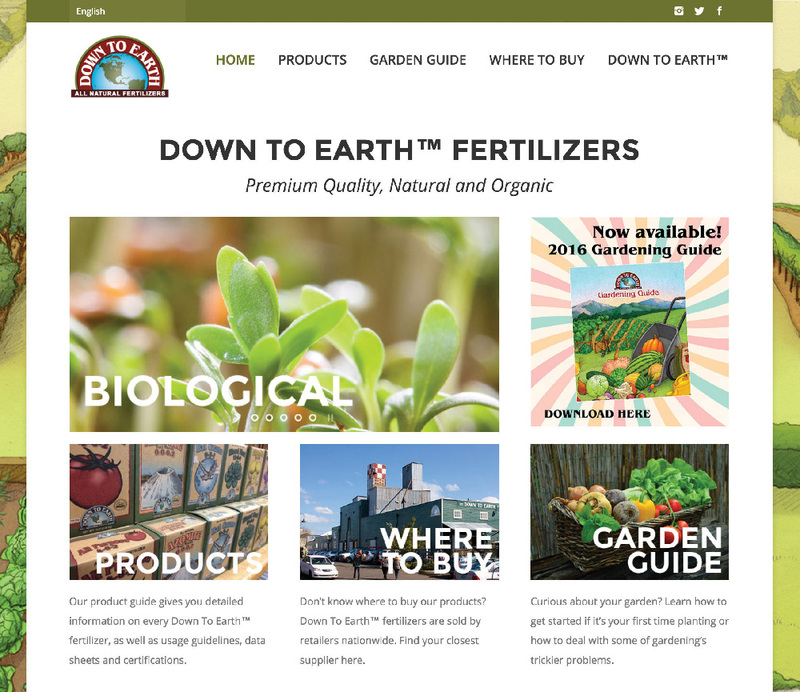 This site covers our complete line of Down To Earth Fertilizers, with feature videos for our single-ingredient and blended fertilizers to help you understand what you need, and the handy "Where to Buy" search engine helps you find a fertilizer retailer close to your home. Sign up for our fertilizer newsletter for more information on product and gardening projects. Our distribution homepage, Down To Earth Distributors is built for our wholesale customers. An online catalog, the website features all of the products that we manufacture and distribute. As a wholesale customer, you will be able to login securely to our full commercial website to get the latest product and pricing updates, view current sales and closeouts, create your favorites lists and, most importantly, place orders any time at your leisure.